Leather boots with low heels, taupe suede. Lightweight and extremely comfortable, you will appreciate its suppleness and timeless style. Proposed options: half sizes (from 35.5 to 44.5) and non-slip pads. Other colors, click HERE. Shipping included to mainland France. Customized model +30€ included. Customized models can not be returned nor exchanges except in case of shoe size error. To custom your shoes with another color choose a standard model and customization option. With its lightness, immediate comfort and suede glittery purple, this leather boot will dazzle you! Other colors, click HERE. Customized model +30€ included. Customized models can not be returned nor exchanges except in case of shoe size error. To custom your shoes with another color choose a standard model and customization opton. Leather boots flat heel, here in white calf supple. Other colors, click HERE. 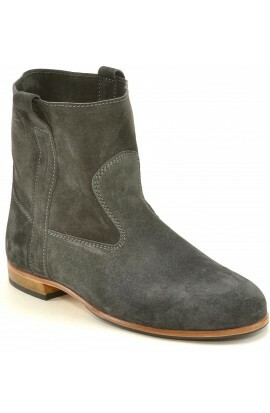 This boot is a must of our collection with its adjustable ankle strap. Soft style, light and very comfortable, perfect for the city. Presented here in original colors, calf suede cherry. Other colors, click here. Non-slip pads included Including shipping to mainland France. Customized model +30€ included. Customized models can not be returned nor exchanges except in case of shoe size error. This boot is a must of our collection with its adjustable ankle strap. Soft style, light and very comfortable, perfect for the city. Presented here in original colors, calf suede cherry. Including shipping to mainland France. Flat heel boots with a ankle strap. Difference from the classical Chelby model : this one has a toe cap. Non-slip pads included Other colors, click HERE. Shipping included to mainland France. These low boots are soft and light. The sparkling leather version (star anthracite) will take you from day to dark with ease. This pair is handcrafted in France. Non-slip pads included. Including shipping to mainland France. These low boots are soft and light. The sparkling leather version (star gold) will take you from day to dark with ease. This pair is handcrafted in France. To protect the leather sole, we recommend you to add rubber pad soles (see options). Non-slip pads included. Including shipping to mainland France. Low boot in soft leather, light and comfortable. Original with this glittery black suede reversed: the shiny side is inside. Once back your boot sparkles Non-slip pads included. Other colors available on request. Including shipping to mainland France. Short boots with heels (4cm) that refines the silhouette and ensures ideal comfort. Presented in our beautiful suede leather that resists water and patina over time. Entirely made in France in our workshop Options: Non-slip pads. Other colors, click HERE. Shipping included to mainland France. Santiago low boots embroidered with its very sharp tip and this upper split on the top of the boot. Non-slip pads included. Shipping included to mainland France. Customized model +30€ included Customized models can not be returned nor exchanges except in case of shoe size error. Santiago low boots with its very sharp tip and this upper split on the top of the boot. Shipping included to mainland France. Elegant version of boots with leather heel and sole. Enjoy the comfort, simplicity and quality leathers that are from the best French tanneries. Non-slip pads & lining included. Other colors, click HERE. Shipping included to mainland France. Customized model +30€ included. Customized models can not be returned nor exchanges except in case of shoe size error. Discover our boot Poppins declined this time in calf suede navy. This shoe very fit with his zipper gives immediate comfor. The ankle strap is removable and interchangeable. Non-slip pads & lining included. Other colors on request. Customized model +30€ included. Customized models can not be returned nor exchanges except in case of shoe size error. Here's our boot Poppins, in a version in light gray calf suede, with a full-grain calfskin strap (removable and interchangeable). You will love its comfort and finesse of its footwear, which showcases the foot. Non-slip pads included. 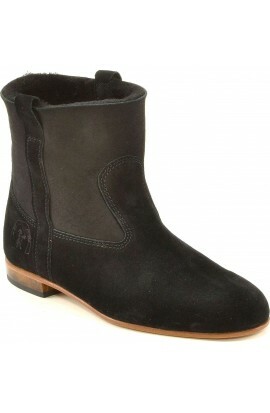 Taste the comfort with this elegant black suede boots. Still snug with his zipper and removable ankle strap, you will not leave them! Non-slip pad included. Other colors on request. Including shipping to mainland France. Customized model +30€ included. Customized models can not be returned nor exchanges except in case of shoe size error. Taste the comfort with this elegant black suede boots. Still snug with his zipper and removable ankle strap, you will not leave them! Non-slip pad included. Other colors on request.